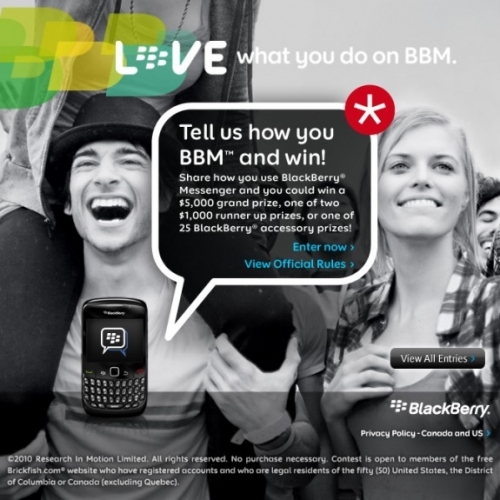 BlackBerry Messenger Contest - Win $5000 | BlackBerry Blast! Research in Motion is running a new contest and the winner will receive $5000. All you have to do is tell RIM how you use BlackBerry Messenger. You can submit a captioned picture or video and the winner will walk away with $5000. The contest will run form June 1, 2010 12:00 AM (PT) to July 13, 2010 11:30 PM (PT). Grand Prize: One winner, selected from the top 25 highest scoring entries, will receive $5,000 to share an experience with their BBM group, or do whatever else they can dream up with the cash. Runners-Up: The second and third highest scoring entries, selected from the top 25 highest scoring entries, will receive $1,000 to share an experience with their BBM group, or do whatever else they can dream up with the cash. Top 25 BBM: Twenty-five Top 25 Prizes will each be awarded a prize pack consisting of one Music Gateway, one Multimedia headset and one BBM t-shirt. Most Viral: One winner, selected from the top 200 Most Viral entries, will receive $500 to share an experience with their BBM group, or do whatever else they can dream up with the cash. Entries can be a photo/image, video upload or YouTube link. This contest is open to anyone in the United States and Canada who are over 18 years of age. For more info see the complete rules and regulations or check out the contest on brickfish to submit an entry. Good luck to everyone that enters! Head over to Brickfish at the link below to enter the contest.